SHANGHAI, China – Next to bicycles, also motorcycles will play a big role in next years China International Bicycle & Motor Fair. At least thats the ambition of the Chinese show organizers together with the Italian industry association ANCMA. SHANGHAI, China – Next to bicycles, also motorcycles will play a big role in next year´s China International Bicycle & Motor Fair. At least that´s the ambition of the Chinese show organizers together with the Italian industry association ANCMA. In Italy the ANCMA yearly organizes the successfull EICMA Bicy and Moto Shows. In 2007 the big EICMA Moto Show will feature its Chinese version that is to be integrated in the Shanghai Show. 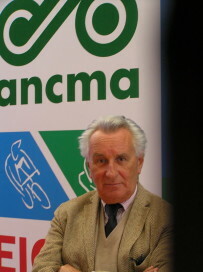 Guidalberto Guidi, EICMA President said in Shanghai: ²This year we are here with about a dozen companies from the Italian motorcycle industry in order to get the smell of the show. Next year we will be here full scale. Our ambition is to grow here to the same level as the EICMA Moto shows in Milan. For the Italian and the European Powered Two-Wheeler industry the Chinese market holds big promises as China will grow into the biggest market for motorcycles.² The 2007 China International Bicycle & Motor Fair will take place from May 4 to 7.